Crafted out of genuine sterling silver, these St. Christopher sports medals will transform a Catholic athletes sportsmanship to a spiritual level. This oval-shaped medal spans a comfortable length of one inch, so it is able to be conveniently worn during athletic activity. On the front will contain an image themed by the sport of your choice. The reverse side will have an etched portrayal of St. Christopher. Your purchase will come in a gift box and include a 24 inch stainless steel chain. If you would like a different size chain please indicate in the "comment section" which measurement you prefer [18", 20", 24", 27", or 30"]. 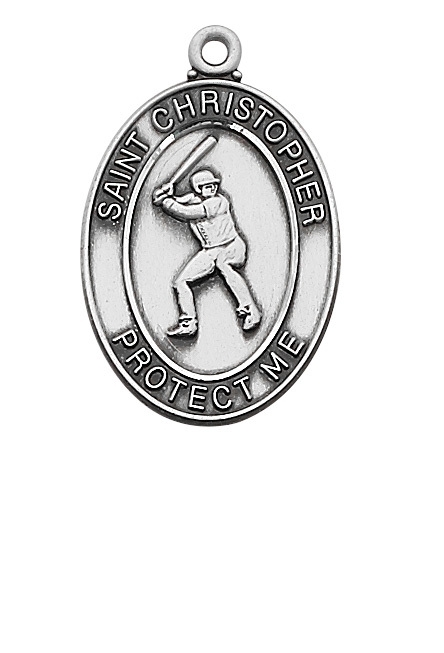 Our supply of St. Christopher sport medals contains a vast diversity of sport themes, including but not limited to the following: - Baseball - Football - Soccer - Girls Soccer (smaller than regular) Please contact us by phone or email for our full selection of sports medals! 14 KT Gold St. Christopher/Baseball Medal, Large Size Catholic Medal, 1" x 3/4" Sterling Silver St. Christopher Pendant, Stainless Silver Heavy Curb Chain, Large Size Catholic Medal, 1" x 3/4" 14 KT Gold St. Christopher Medal, Large Size Catholic Medal, 1" x 3/4" Sterling Silver St. Christopher/Baseball Pendant, Sterling Silver Lite Curb Chain, Medium Size Catholic Medal, 3/4" x 1/2"